Here I am at last. Pffff, it was a week of all kind of things. Tuesday the trombosis service came rather early( by the way, it was a young man), so that was nice. Jan was given a temporary schedule fo hs bloodthinners, and had to go to controle on Friday morning. Now it seems that he is on a rather regularly schedule so that should do the trick. Now I only have to phone them again to see, if we can put the contole on another day, because when it is on Friday, in the afternoon Jan has to go to his volunteerjob and that is kind of unpractical and busy. After the young man left on Tuesday, I could go out and so I did. I did copy all the papers for my accountant and sent them to him, pffff, that is done. One thing off my mind. Cannot remember really what was on on Wednesday. I think some shopping or so. Thirsdaymorning I was at my doctor, about my stomach. He asked me to give a specimen of something(probably you understand of what)and bring it to hospital to let it examin, it might be that all that stomach trouble is cause by a bacterie of virus. Till there is a conclusion, I am still on the pills(they do most of the time their job, but I just want to get rid of them if possible). Next week doctor is on holiday so I will have to wait till I can phone him. In the afternoon Jan had to go to a hospital far away(about 1/2 an hour with the tram) for an MRI scan of the liver and surroundings. result will be heard on the 29th from his doctor. So we had a rather medical week, you can say LOL. One or two days we really had rather nice weather, although a bit cold, there was sunshine. and we had one little surprise in the garden. Jan just was looking into the garden from the kitchen window and called me to watch too. And I saw a little parakeet having a meal in our birdfeeder! WOW, that was so cute to see and something I hoped for but never expected to see. I was too late to make a photo of it, but perhaps if will happen again and I can make a photo of it. The weather all together is acting a bit uncomprehensible almost. we had some great days with sunshine, blue sky, low temprature, then temps got higher, but it brought rain and wind and at the moment there is a wind of ca. 6 Beaufort here. So I guess Jan will go walking to his volunteer job and will take the tram back, because it's too much wind to go by bike. There will be temps of about 10-11 C for today and tomorrow, then it will go down again a bit to around 7 or 6C, also nights again a bit colder, 2 to 0 C, all very strange. There is just one thing I am crossing my fingers for and that's no more real frost and cold. it still could happen here, you know, in March and even April! Oh, yesterday afternoon just was settled on the couch, with my fleece blanket, just considering if I would take a nap(Jan already had left for his volunteering) and then the phone rang. It was Heidi, asking me if I could go to the doggies to let them out. She was somewhere she couldn;t leave right away and then she would be home too late. I wasn;t pleased with it to be honest, because it was raining and wind started blowing already, but gave in, of course. I went to their house and the doggies where ever so pleased to be able to do their thing outside, hahaha. Home again i didn't take a nap anymore, no, I took a bowl of bean soup out of a can( that I made into a real meal soup, added potatoes, some fresh vegetables and slices of smoked sausage to it in the afternoon already) and watched some tv till Jan came home. Now today I just want to be in my lounging fleece pyama's and not doing too much hahahaha. Poor Jan still has to go to his volunteering today too. Well, I will make his dinner and advance, and when he comes home will shove it in the oven, then he can have his dinner and he will be able to quickly take a nice nap on the couch. and when he wakes up again, probably after an hour, we will watched some stuff we already recorded on our dvd. Wonderful. 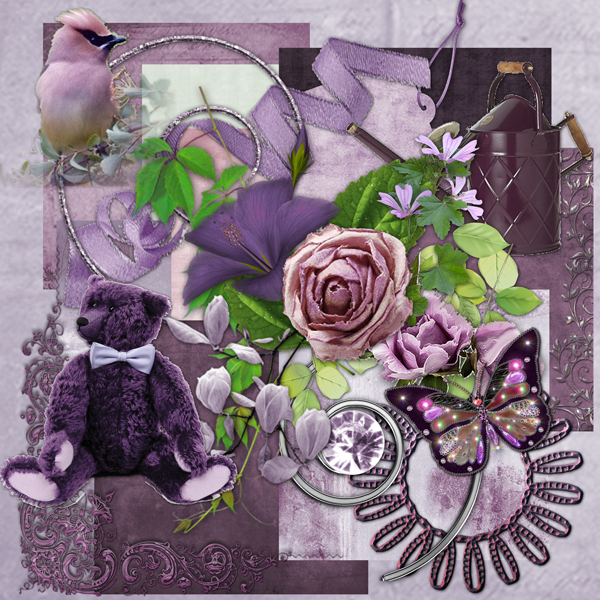 Well, I think I chatted long enough now, time for your freebie, some clusters and a quickpage by Arlene, made with the Suddenly you were there kit. Have a lovely Sunday and start of the week! We'll just have to put up with some more colder days. Yes, I am rather late in posting, I wanted to post a couple of days earlier but just hadn;t the right spirit for it. That happens to me quite often lately and I hate it of myself. well, it's just something that happens and it will go away too, just have to sit it out guess LOL. Weatherwise we have had some colder days, and there will follow some more, specially overnight. Some degrees of frost, here on the coast, not all too much, hoorray, but if weatherforecast is right, there will be a huge change in temps by the end of the week. Oh, I cannot wait till it happens. We have an old house which of course lets through some cold and some wind and such, that is the trouble with old houses. 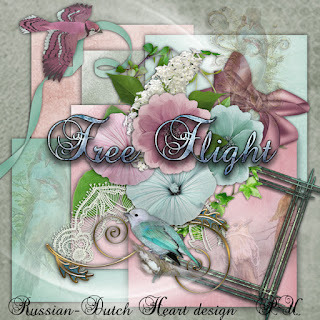 Of course you can do a lot about it, if you have a big suitcase of money(as we don;t have LOL). But I think that it also feels at times colder in the rooms because of the work they are doing in the appartment upstairs. I guess, they don;t have much heat on when at work and overnight. Yesterday I was pretty much busy at the phone part of the day to get through to the trombosis service. Jan was given some bloodthinner medication by his doctor, but had to be called by this trombosis service for an appointment for take-in talk and such. Didn;t hear from them and as Jan was on a temporary dosis by his doctor he needs a new schedule for today. And of course I had the luck to get the message at the phone they were moving! well, after phoning hospital and finding a 06- phonenumber I finally contacted the service and now they come to our house today. Pffff, who needs things like this? I don;t. still I am glad all was sorted out. Then jan has to have an MRI for his liver and such and on Thursday and then has another appointment with his doctor at the end of the month. I am not really hapy with those extra bloodthinners, but it seems to be necessary at the moment. Let's cross fingers they do their job and that soon he can take less or perhaps even just one of the two. For now we are waiting at the lady of the tromosis service. They couldn;t give us a fixed hour, they come between 08.00 a.m. and 14.00 p.m. That could be a long wait and I hate those kind of appointments. I want to go out today, although it isn;t all too warm, but the sun is shining at the moment and I want to copy the papers for my accountant so I can send them away and he can do the tax papers. Now i will have to wait for the lady. I just want to be there too when she comes around. Saves Jan too the trouble of telling me all what is decided later. As you can guess perhaps, I didn;t do much of computering the last week and certainly not designing, but I do have still a kit for you. Named it "Suddenly you were there." Hopefully real soon I will be able to have peace and quite of mind and body again and then be able to design some more. You all have a wonderful day and rest of the week! I am late with the post, I wanted to write Monday or yesterday, but just hadn;t inspiration for it and was a bit tired too so tried to sleep as much as possible. All more or less due to the renovating they are doing upstairs. But here I am with a little post at last. How was the weekend? Not too bad, glad to say. Saturday afternoon I went to Séeverines gathering for her birthday, I managed to sit there for more than an hour, wow, and then went home again. Yea, I know, it doesnt sound so nice, but I have no connection to their families at all so after an hour or so all general items have passed and have been commented so time for me to go. Heidi understands me and has no problem with it LOL. Sunday evening it started to rain on and off and the wind became really of stormy force and that was even more on Monday. So I was happy to be able to stay inside but Jan had to go to hospital for a yearly ultrasound check of his stomach and tummy. Poor guy, he had to wake up early for one and then go through that stormy weather. Well, he came home safely again and will get the result on Thursday, when he goes to his doctor for the yearly talk. Just in the weekend my stomach started to do funny things again, and I was already so happy to be without the pills for about a week!. So I took them again, and slowly it settled again and at the moment I dont have much trouble. But i think I will go to my doctor next week to have a talk about it. I know, a lot of it can be pinpointed at just stress, but perhaps a little check cannot do harm, you know. we'll see net week, I don;t want to worry about that yet, if there is anything to worry about at all. I think we all need some sunshine and warmer weather, that already could do a lot of good. As for the garden it could be nice too, the soil is soooooo super wet at the moment because of all the rain we had, it is time it stopr for a while. Don;t know yet how the weather will be today, it looks as if it will have some dry moments. may be they will last long enough to let me go to the market and back home again, without a shed of heaven water on my head LOL. In between all the usual stuff we girls have to do in the house, I also have lots of fun preparing our dinners at the moment. I follow several cooking programs on tv in which they make not all to difficult dishes and I tried some of them (or something with my on twist, ROFL). Then I also am lucky to have a husband who tries it all without any problem, and almost never refuses to eat something, hahaha. The only thing I know I better not make him is spaghetti. I love it, but he has something against it. So I make sometimes spaghetti and something for myself when he is at his volunteer job and make him something else he can put in the oven and likes a lot more(or something he likes and I dont!). think that is a good compromise between us hey? 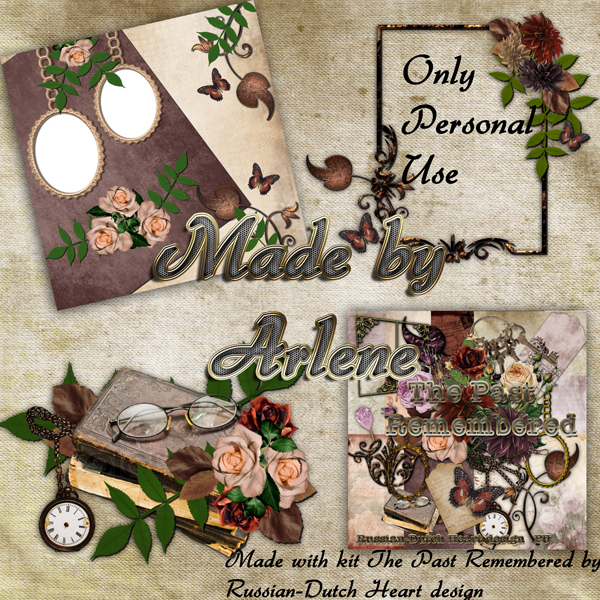 Okay, time to get dressed and such, so I finish the post with a freebie from Arlene, clusters made with the kit Missing Always(one clusters and two quickpages she has made, gorgeous!). Have a wonderful day and rest of the week! Yes, I was in the garden for a moment yesterday and saw little bunches of snowdrops and crocus, they need just some more sun and they will bloom! It's a bit crazy, to have them almost blooming this time of year. I removed a bit of weed and mosspatches, so that the soil can "breath"a bit, but the soil was too wet to do some serious work on it. It is better and easier too, to do this kind of work when the soil is rather dry. I had a nice email this morning, from my niece from France. We do now have a lot of contact but every now and then we send a little message, to let know all is okay and how we are doing. It is sweet of her, to think of us. Also yesterday I did the shopping needed, get us some bread, catfood, the usual things and now I am all ready for the weekend and longer. How great is that? I might even pop into my lounge pyama later and enjoy a snuggle day LOL. Depened also a bit on the weather. It looks as if it will stay dry the rest of the day, although it is cloudy. May be it will be a good idea to pop our for a moment, just to have some fresh air. I've not decided yet. And may be I can do some ironing and get rid of the laundry, put it away on its place. Already did some necessary housework this week, so I am almost duty-free LOL. Tomorrow I'll have to go to Séverines birthday party, I don;t mind, but I don;t have a real connection with their family and friends, and those moments Heidi is much too busy with everyone, to be able to chat with me for a long time. So I think I will just stay for a little while and try to visit Heidi later next week. Sounds like a good idea to me. So this is about all there is to tell, not really exciting, I know, still I am happy with that fact. I settle for even kind of boring, how lovely is that? And then wait till spring arrives and get busy outside, which is always good, when you can do that in nice temperatures and with some sunshine, and then suddenly all kind of little things happen again. 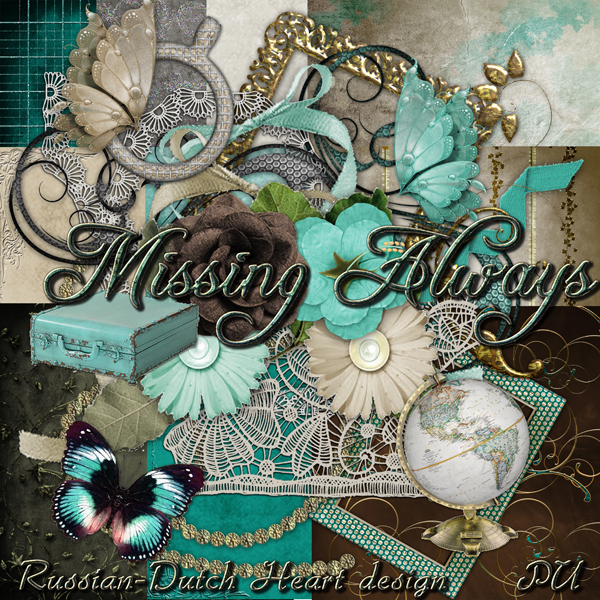 Till then, bare with me and to compensate you, LOL, I have a kit for you, named Missing Always. Have a lovely weekend and see you later next week! Oh yes, we still have good temperatures, all around 7-10 C daytime, nights around 5. and that is quite high for this time of year. Only thing that is a pity, is that we have lots of wind. But it will settle down till the end of the week(they say). Still there isn;t all too much too complain, is it? The weekend went by very quiet, and I could say nice. I even got at some times busy in the house, LOL, and that is already a step forward. Oh, and i stopped with taking the stomach pills as of Friday and till now it all goes quite well. Only yesterday evening I had a little annoying feeling in the stomach, which only lasted for an hour or so. May be I can go on without those pills, would be wonderful. Very slowly I started on designing again. Oh, don;t get excited yet, I just made a few papers and elements, so it's still a long way to go to have a complete kit again, but hey, it's a start! 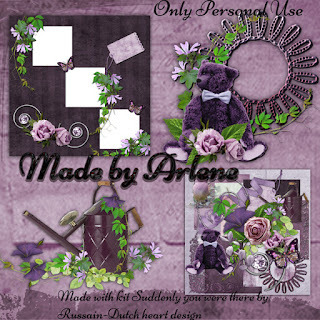 I am glad to know, that i am not the only one who has at times trouble to do some designing, It seems Arlene too has such a period, but whenever I send her a kit, she still makes the wonderful clusters! And on top of it she is suffering from a flu attack at the moment, poor girl! I told her to take it easy and first get rid of that flu and then perhaps think about making more clusters, if I have a kit ready. It isnlt looking all to bright outside, it's a bit grey, although till now dry, but periods with strong wind. Hmmm, I think it will be best for me to do some shopping now, because later today they say it will be raining. Those forcasts aren;t always to accurate, but in case they are right this time I better get dressed and moving. And then Jan can have another nap, because the workers in the appartment above us were busy long before 08.00 this morning with a d.........d machine that made a lot of noise. So we were awake and now nobody seems to do anything anymore(or they left). Thank you very much. As Jan is going to bed very late, he is kind of a nightowl, he could do with a couple of hours more sleep. 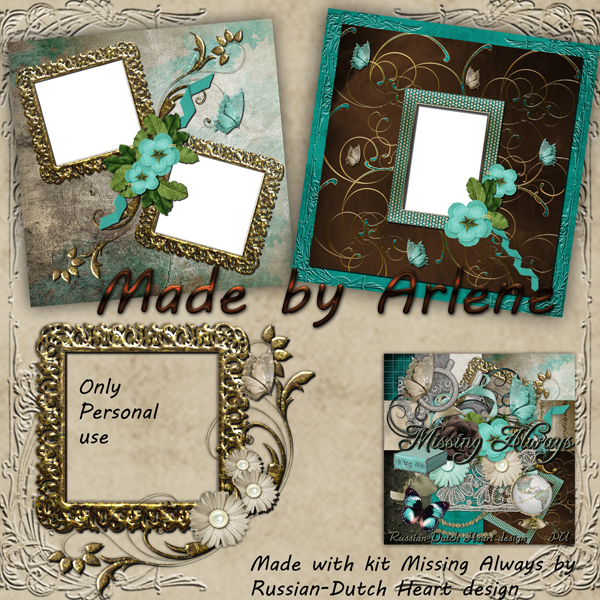 I have some wonderful clusters and a quickpage from Arlene, made with The Past Remembered kit. Have fun with them, have a lovey day.